RFA Largs Bay (L 3006) was a Bay-class landing ship that served with the Royal Fleet Auxiliary (RFA) from 2006 to 2011, before being transferred to the Royal Australian Navy (RAN) and renamed HMAS Choules (L 100). The vessel was built by Swan Hunter in Wallsend, Tyne and Wear. She was named after Largs Bay in Ayrshire, Scotland, and entered service in November 2006. 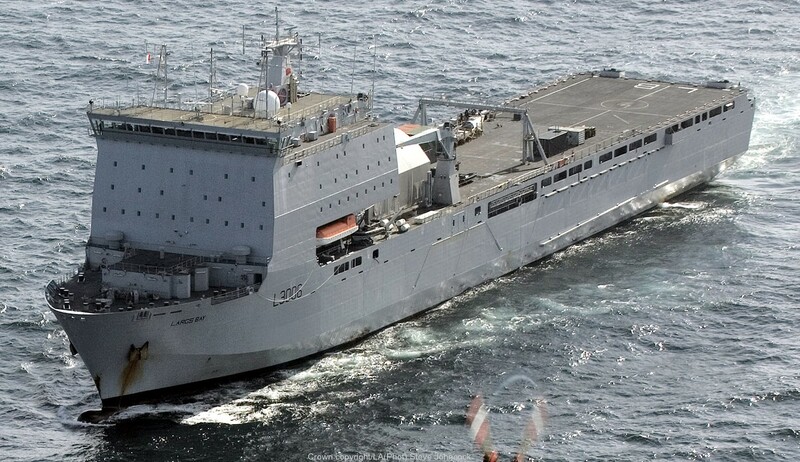 During her career with the RFA, Largs Bay served as the British ship assigned to patrol the Falkland Islands in 2008, and delivered relief supplies following the 2010 Haiti earthquake. At the end of 2010, Largs Bay was marked as one of the vessels to be removed from service under the Strategic Defence and Security Review. She was offered for sale, with the RAN announced as the successful bidder in April 2011. After modifications to make her more suited for Australian operating conditions, the vessel was commissioned in December 2011 as HMAS Choules, named after Chief Petty Officer Claude Choules. A propulsion transformer failure kept the ship out of service between July 2012 and April 2013. Four months after entering service, an engine room fire resulted in steering and propulsion issues, requiring Largs Bay to be towed to Plymouth for repairs. In late November 2007, Largs Bay embarked 815 Naval Air Squadron 215 Flight and left home waters for the Caribbean to conduct counter-drug operations. She visited eleven islands including Barbados, Curaçao, Grand Turk, Martinique, Trinidad and also the USA. Three days after leaving Barbados Largs Bay's patrolling helicopter spotted a small fishing vessel stopped in the water and detained her after a pursuit; 575 kilograms (1,268 lb) of cocaine were recovered, with an estimated £20 million European street value. She participated in Navy Days while in port at Curaçao, where several hundred people toured her. In late 2008, it was reported that Largs Bay was to replace HMS Northumberland for duties in the Falkland Islands. Northumberland was to have left for the Islands in December 2008, but was instead sent for pirate patrol off Somalia. In early 2010, Largs Bay was deployed to the Arctic Circle. Following the 2010 Haiti earthquake, the ship was pulled from exercises and sailed on 3 February to deliver a load of relief supplies to Haiti. On 18 February 2010, she arrived at Port-au-Prince and unloaded 430 tonnes (470 tons) of supplies plus 165 tonnes (182 tons) of rations, while engineers from the ship began work on restoring electricity ashore. On 30 March 2010, she returned home. Largs Bay's actions were recognised in December 2011 with the awarding of the Firmin Sword of Peace. In August 2010, the ship participated in the Bournemouth Air Festival. In December 2010, it was announced that the ship would be decommissioned in April 2011 as part of the Strategic Defence and Security Review. Shortly after marking Largs Bay for disposal, the British Ministry of Defence contacted the Chilean government and suggested the vessel as a potential replacement for the landing ship tank vessel Valdivia, which was due to leave service. In January 2011, the Australian Department of Defence announced that it was interested in purchasing the vessel for the RAN as a replacement for the heavy landing ship HMAS Tobruk or one of the Kanimbla-class amphibious warfare ships. Interest in the ship was also shown by Brazil and India. On 17 March 2011, the Australian Department of Defence announced that the RAN would be bidding for Largs Bay; this was followed on 6 April by news that a £65 million (A$100 million) bid had been successful. Sea trials during April showed that the ship was in good condition, although she would have to be modified before entering Australian service, particularly to allow operation in tropical conditions. During a 16-week docking at the A&P Group shipyard in Falmouth, the modifications were made, along with refit work to maintain the ship's Lloyds certification. The RAN also acquired two Mexeflotes for use with the ship. On 13 August, it was announced that Largs Bay would be renamed HMAS Choules when commissioned into the RAN. The name comes from Chief Petty Officer Claude Choules, who served in both the Royal Navy and the RAN during his career, and was the last known living participant in World War I. Choules is the second RAN vessel to be named after an enlisted sailor, following the submarine HMAS Sheean. The ship was assigned the pennant number L100, reflecting the 100th anniversary of the RAN's origin in 2011. Her motto is "Face Difficulty With Zeal". On 14 October, the vessel was handed over to the RAN. She arrived in Fremantle, Western Australia on 10 December, and was commissioned into the RAN on 13 December. Choules entered full operational service in early 2012, and is based at Fleet Base East. On 24 February 2012, Choules arrived in Townsville. This was in preparation for a month of amphibious warfare training exercises with the Australian Army's 3rd Brigade. In June 2012, one of the two main electrical transformers involved in the ship's propulsion system failed, after an earlier engineers report highlighted "overheating of the propulsion motors and transformers". Inspection found that insulation failure had short-circuited the transformer, while other transformers aboard showed premature wear. Unable to find an available spare, a new unit had to be ordered from the manufacturer. In June, it was predicted that Choules would be out of service for four to five months, but by October, claims were made that the ship would be inoperable until at least January 2013, and if all of the wear-showing transformers were replaced, she would not return to service until April 2013. By December, the faulty transformer had been replaced, and the RAN had decided that although the other transformers (propulsion and others) had been shown to have acceptable levels of wear, all would be replaced before Choules was reactivated. These repairs were completed in early 2013, and the ship was assessed as ready to re-enter service on 12 April. For a short time from July 2013, Choules was anchored offshore of the Manus Island Refugee Processing Centre in Papua New Guinea to provide temporary accommodation for Department of Immigration and other personnel, due to a lack of accommodation at the Centre. In April 2015, the ship transported 46 Vietnamese asylum seekers back to Vũng Tàu, after their vessel was intercepted at sea on 20 March by Australian border protection units and their claims were rejected after interviews at sea lasting less than 40 minutes. Choules' operational role will be reevaluated after the Canberra-class landing helicopter dock ships enter service in 2016, but will likely be kept on to fill the role of the strategic sealift ship envisioned by the 2009 Defence white paper. Largs Bay is an area in the Firth of Clyde in North Ayrshire, Scotland.